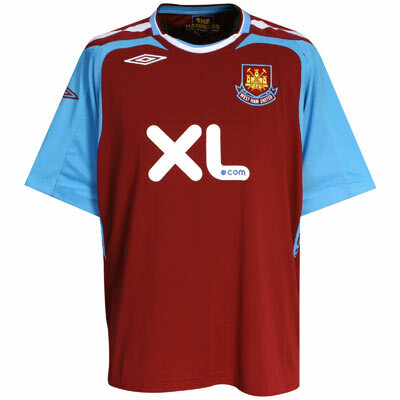 There’s been a picture released showing the new West Ham kit for the 2007/2008 season. At first glance, it doesn’t reach out and impress me. The Umbro badges on the shoulders look tacky and the collars look a little too wide. That said it’s better than some of the monstrosities that we’ve had in recent years, and the badge looks better than the current kit, which looks like an iron-on transfer. I just hope we’re in the Premier League when we get to wear it. The wife was running late last Sunday, and as it’s the day that I take the kids to visit my mum’s house, se asked me to get our son dressed. This is something I rarely do. I have no problem dressing any of the kids, but I’m the first to admit that I don’t know what trousers match which tops, and what’s suitable for various activites. I’ve lost count of the times the wife laughs at my efforts before quickly swapping a top I’ve chosen for one of the girls. The advice I get given is along the lines of “stripes don’t go with spots” and “that’s far too thin for them to wear in Winter”. Given the chance to dress our 9-month-old though gave me the opportunity to put him in Claret and Blue – a rare occurrence in our house, what with the other half supporting Spurs. A couple of hours later I was at mum’s house, with all of the kids. Mum’s a West Ham fan too and was trying to get the girls to learn some of the chants. “Come on you Hammers!”, she shouted. My four-year-old daughter was quick to get in on the action, and as with most kids of that age, misunderstood the words as she repeated them. Somehow, I don’t think that we’ll ever hear these words at Upton Park!